While Acadiensis remains committed to publishing review essays in the pages of the journal, occasionally we receive books that do not easily lend themselves to our review essay format. When this occurs we will publish single book reviews here on the Acadiensis blog. Here is the first such review. 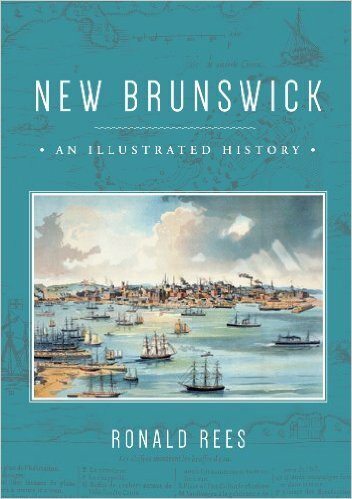 Ronald Rees, New Brunswick: An Illustrated History (Halifax: Nimbus Publishing, 2014). Of all of Canada’s provinces, New Brunswick is likely the one most in need of an up-to-date provincial history. It was thus with great pleasure that I first learned of Ronald Rees’s New Brunswick: An Illustrated History. I was further delighted upon receiving the book to find out that it was written for a general audience, and therefore had the potential to reach a large number of readers. Drawing “almost entirely from published sources”, including books, articles in journals and edited collections, and graduate theses, Rees lays out a “narrative . . . [of] the development of the province” from the pre-Contact period to the 20th century (IX). Consisting of 11 chapters, the first three cover the First Nations, the arrival of the Europeans, and the creation of the “Loyalist World.” Curiously, the first chapter is the shortest, with Rees devoting less than eight pages out of 221 to the thousands of years of history of the Mi’kmaq, Maliseet, and Passamaquoddy peoples. This is then followed by brief but sympathetic sections peppered throughout the book describing the post-Contact lives of Indigenous peoples, from trading with the first Europeans to the creation of reservations. The second and third chapters are on the 17th and 18th centuries, and Rees’s training as an historical geographer really comes to the fore through discussions of Samuel de Champlain’s failed settlement on St. Croix Island, the Acadians’ dyking techniques and responses to the deportations, and the Loyalists’ surveying and dividing up of the landscape into landed estates, smaller farm lots, and townships. The 19th century is the focus of the fourth to eighth chapters. In many ways, it is clear that Rees considers the 19th century to be the high point of New Brunswick’s historical development. He frames this period as a so-called economic golden age, when many immigrants arrived and industries like overseas trading, timber harvesting, and shipbuilding flourished under British imperial tariffs, but struggled to make the transition to the continental economy later in the century, particularly after Confederation. This 19th-century-as-economic-golden-age narrative is an older interpretation of New Brunswick history, and Rees seems to have adopted it, at least in part, from W. Stewart MacNutt’s New Brunswick: A History, 1784-1867, published in 1963. In fact, much of the book comes across as an old-style economic history, in which the residents of the province are portrayed as simply acquiescing to larger structural forces. For example, the author explains outmigration from New Brunswick in the later decades of the 19th century as people fleeing a declining economy, rather than as a nuanced form of human adaptation and survival. The ninth to eleventh chapters examine the 20th century. As a consequence of establishing New Brunswick’s economic golden age as having occurred in the 19th century, Rees sets up the 20th century to be viewed as a time of stagnation and decline. He then uses the ninth chapter to explore “new directions” in the provincial economy, including pulp and paper manufacturing, aquaculture, tourism, and rum-running. After sections on “French New Brunswick” and the 1960s reforms of the Louis Robichaud government, Rees provides what is likely my least favourite chapter in the book. Titled “The Oligarchs” and containing the bulk of the post-Second World War content, it is devoted to the biographies and business dealings of K.C. Irving, Max Aitken (Lord Beaverbrook), and Wallace and Harrison McCain. Rees argues that the New Brunswick economy would have been much worse off without these oligarchs, but neglects to fully take into account such factors as widespread opposition to their economic machinations and competing visions of development that were not endorsed by the state, such as those put forward by woodlot owners’ associations, unions, farmers’ groups, and conservationists and environmentalists. All of this leads up to my main criticism of the book: its often misdirected economic fixation. One of the problems associated with this sort of approach is that actual lived experiences frequently get swallowed up by the general narrative, as in the case of the earlier mentioned outmigration example. This is not to suggest that Rees does not tell the stories of a variety of peoples, but he does so more often than not with an economic bent. In doing so, whole aspects of past individuals’ lives are missing from the narrative. Important categories of historical analysis like gender and class are also largely sidelined, and even major historical developments like the Acadian Renaissance and the Maritime Rights Movement are reduced to one sentence each. Furthermore, by constructing a narrative that is centred on the fact that New Brunswick’s economic golden age occurred in the 19th century, and was proceeded by decades of stagnation and decline, Rees places too much emphasis on a linear progression of events that does not accurately reflect the complexity and range of local efforts to stimulate economic growth. The end result is a vibrant account of 19th-century economic activity, while the 20th century seems listless and uninspired in comparison. As an historian whose work primarily focuses on the 20th century, I am rather dissatisfied with the coverage of the years after the Second World War. A lot more happened than simply the business dealings of K.C. Irving, Lord Beaverbrook, and the McCains, and there are many secondary sources that attest to this . Ronald Rees needs to be commended for taking on the task of writing a provincial history of New Brunswick. What he has produced is well written, contains dozens of spectacular historical photographs, and is wisely aimed at a general audience. That said, its resemblance to an old-style economic history means that the wait for an up-to-date provincial history continues. Mark J. McLaughlin is SSHRC Post-Doctoral Fellow at Trent University. On 1 January 2016 he will take up a tenure-track position in the Department of History at the University of Maine at Orono. Rees states in the preface that he has “drawn shamelessly upon” MacNutt’s book, IX. This entry was posted in Book Review, New Brunswick. Bookmark the permalink.